All gas and power contracts increased this week, with front season contracts reaching record highs of any season-ahead contract since 2008. This was due to sustained bullish market fundamentals, including fresh 10-year high carbon prices, five-year high coal prices, and a third consecutive weekly oil price rise. Day-ahead gas prices gained 7.6% to 74.5p/th, a fresh five-month high. October and November 18 gas contracts ended the week at fresh highs of 74.1p/th and 79.1p/th respectively. Seasonal gas contracts gained 6.9% on average. Day-ahead power prices rose 3.7% to £69.5/MWh, supported by soaring commodity prices. Low renewables generation has continued to push power prices up and has led to an increase in thermal power generation, including coal power which resulted in only four coal-free hours since the start of September. Seasonal power contracts went up 3.4% on average. The weekly average Brent crude oil price rose for the third consecutive week, gaining 3.5% to average $77.9/bl. Oil topped $79.0/bl on 4 September as oil platform evacuations began in the Gulf of Mexico ahead of tropical storm Gordon. EU ETS carbon prices rose for the eleventh consecutive week, increasing 3.0% to average €21.1/t. EU ETS carbon hit a fresh 10-year high of €23.2/t on 7 September following the auction of 4.4mn EUAs in Germany at €22.5/t. API 2 coal rose 3.6% to average $94.2/t this week, rising to a fresh five-year high of $96.0/t on 7 September. Day-ahead power rose 3.7% week-on-week to a fresh five-month high of £69.5/MWh. Prices have found support from a tighter market as planned maintenance restricts the French interconnector to 1.0GW capacity until 15 September. October 18 and November 18 power reached record highs of £70.3/MWh and £74.8/MWh respectively. 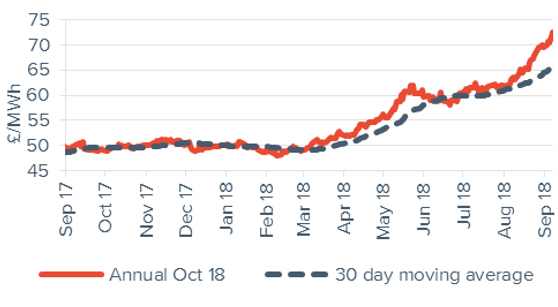 The annual October 18 power contract gained 4.7% to end the week at a record high of £67.4/MWh (up from £64.4/MWh). The contract is £9.1/MWh (15.7%) higher than the same period last month, and 51.6% above the same time last year when it was £44.5/MWh. 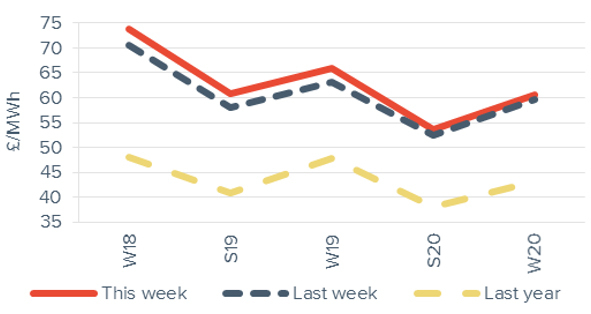 Day-ahead peak power gained 5.0% week-on-week to £74.0/MWh, £4.5/MWh above its baseload counterpart. 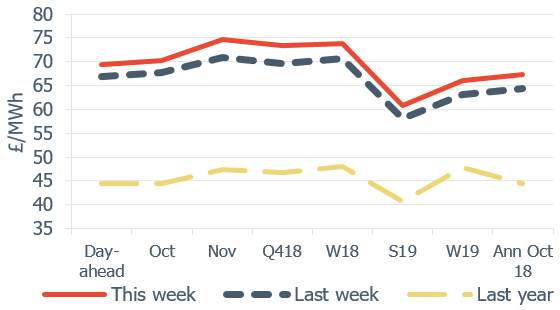 Month-ahead peak power gained 2.4% to end the week at a fresh high of £75.9/MWh, £5.6/MWh above its baseload counterpart. 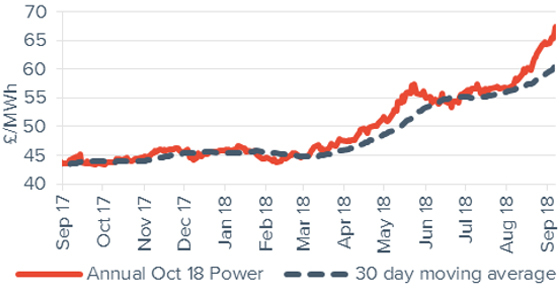 Annual October 18 peak power increased 4.3% to £72.6/MWh, continuing to remain £5.2/MWh above its baseload power counterpart. The contract was 14.6% above its price last month (£63.4/MWh). Week-on-week, seasonal contracts were up 3.4% on average. All seasonal baseload power contracts hit fresh highs this week. On 7 September, winter 18 power peaked at £73.9/MWh and summer 19 rose to £60.9/MWh. Week-on-week, seasonal peak power contracts increased 4.3% on average. Prices continue to be influenced by bullish gas and carbon prices. 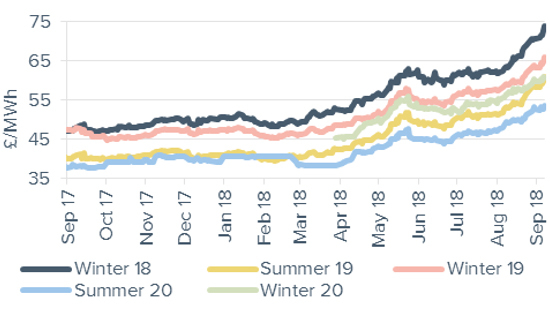 The winter 18 and summer 19 peak power contracts both gained 4.3% to £80.4/MWh and £64.9/MWh respectively. 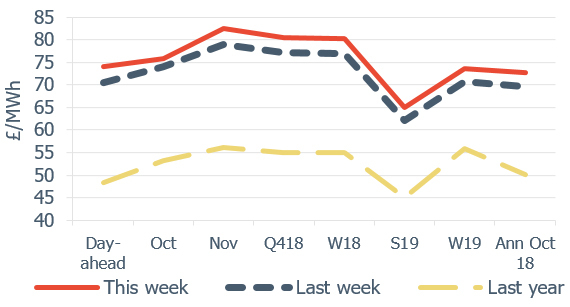 The weekly average Brent crude oil price rose for the third consecutive week, gaining 3.5% to average $77.9/bl, up from $75.3/bl the previous week. Oil topped $79.0/bl on 4 September as oil platform evacuations began in the Gulf of Mexico ahead of tropical storm Gordon. API 2 coal rose 3.6% to average $94.2/t last week. 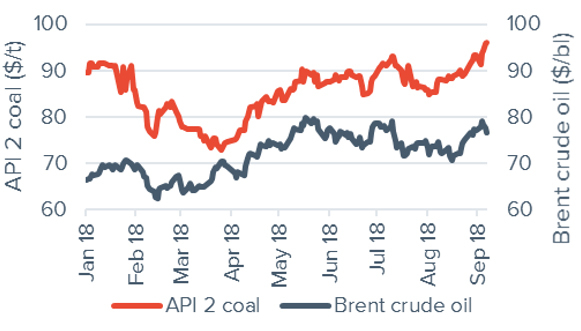 API 2 coal rose to a fresh five-year high on 7 September of $96.0/t. 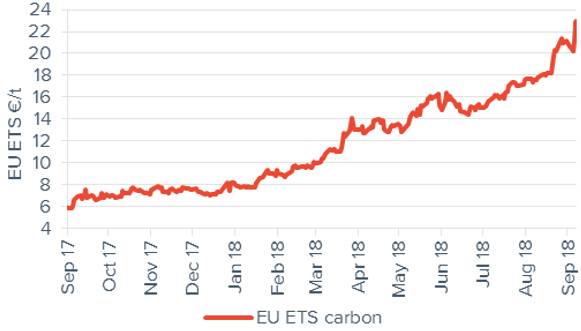 EU ETS carbon prices rose for the eleventh consecutive week, increasing 3.0% to average €21.1/t. Prices started the week below €20.0/t on 3 September due to increased auctions volumes and the upcoming expiry of September options. EU ETS carbon hit a fresh 10-year high of €23.4/t on 7 September following the auction of 4.4mn EUAs in Germany at €22.5/t.